Savage Arms 57355: Savage's 110 Storm model delivers a customized fit required for consistent accuracy. It features Savage's AccuFit synthetic stock with five comb riser sizes for the perfect cheek-to-stock weld, four composite inserts to establish your unique length-of-pull, and AccuStock. The AccuStock consists of a rigid rail system firmly embedded in the stock throughout the foreend of the rifle. It also engages the action three dimensionally along its entire length. The 110 Storm also features AccuTrigger for flexibility, a stainless steel barrel, soft grip fore-end and pistol grip, and a detachable box magazine. 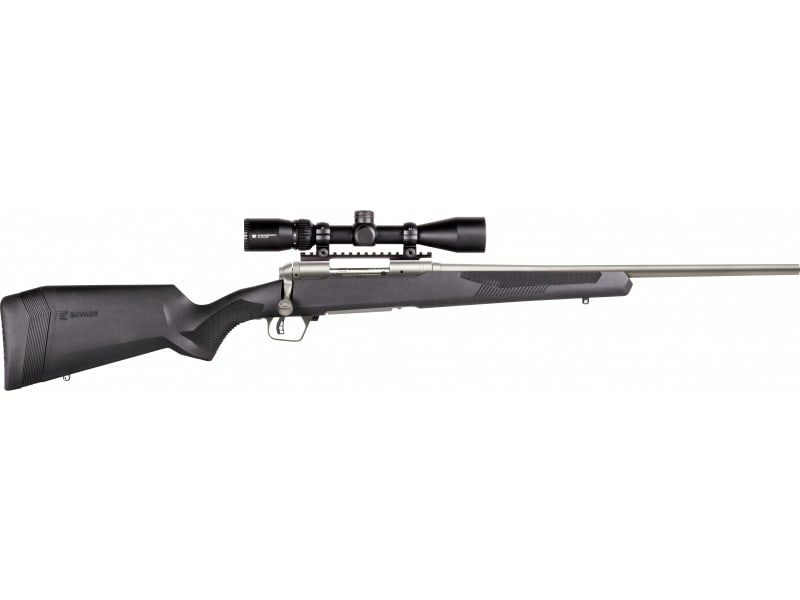 This 338 Winchester Magnum Apex model has a 24" stainless steel barrel and a Vortex Crossfire II 3-9x40mm scope.